Italy moves too slow and it needs to accelerate significantly. This was the main diagnosis emerging from our last year report. One year later, the scenario has not changed. 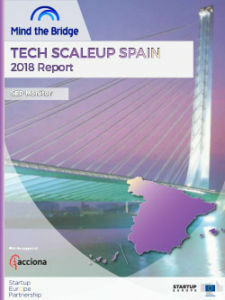 Italy still ranks 11th in the European Scaleup Europe ranking. And the gap from the top has become even wider. Moving slow in the world of technology equates at not moving at all. And, if you are late, it is difficult to catch up with the opponents that are ahead of you if you don’t start running. Truth to be said, our research focuses on scaleups, that are the more mature outcomes of a startup ecosystem. Since it takes time to raise a scaleup, it is likely that some of the recent progress the startup has not been captured yet by our data (we consider only companies able to raise $1 million and over). That said, Italy in terms of scaleups ranks among the underperformers in Europe. The UK, France and Germany, but also Spain and smaller countries such as The Netherlands and Ireland look simply too far away. And while these countries are injecting billions, Italy is distilling a few hundreds of millions of Euros. 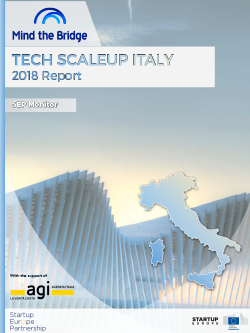 While presenting this report last year, we recommended to the elected government to launch a sort of Marshall plan for innovation in Italy. Inject €2 billion in the Innovation economy to push and leverage private investments and try to narrow the huge gap Italy faces. Now Italy has a new government. The recommendation stands. Stay put is not an option. The risk is not only to crush and burn the improvements the startup ecosystem has achieved in the past few years. What’s at stake is the sustainability of the entire industrial sector that without innovation concretely risks to be disrupted.